The Aluminum Cookware Set use the non-stick platinum coating from Germany, Excalibur PFOA-free (Perfluorooctanoic acid-free), which is safe and environmental friendly. The body adopts the aluminum casting which speeds up the cooking process. The pot underwent the micro particle and thermal spraying to have its metal surface. With this surface, it is firmer and more durable. The Two-side handles are casted together with the body; they are seamless and easy to clean. The long handle underwent the Bakelite interface treatment to enhance its heat- resistant and anti-scald function. The lid is produced by the high-end glass coating process, it is strong, high temperature-resistant and has good sealing performance. The composite bottom allows more even and faster heat conduction and is suitable for a variety of stoves. 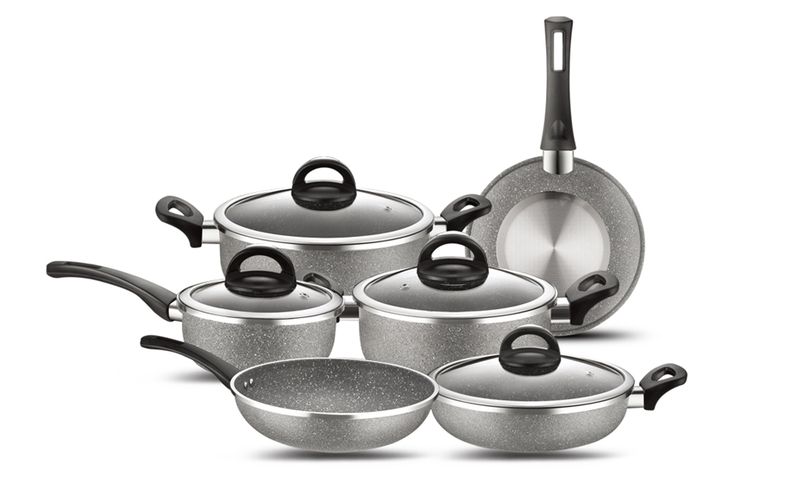 Looking for ideal Non-stick Coating Cookware Manufacturer & supplier ? We have a wide selection at great prices to help you get creative. All the Cheapest Aluminum Cookware Set are quality guaranteed. We are China Origin Factory of Good Kitchenware Set. If you have any question, please feel free to contact us.